Riding a motorbike 1666 kilometers (1035 miles) through the vast countrysides of Northern Vietnam was one of the most rewarding travel experiences I’ve ever had. Breathtaking vistas of layered rice terraces, wandering water buffalo, blissful and generous people, authentic local cuisine — it all felt too amazing to be real. I was living out an exhilarating and spontaneous dream, and each day was brimming with freedom and amazement. But, it was my first time riding a motorbike and I was doing so in a foreign land. Was I nervous going in? Absolutely. My heart raced at the thought of learning a new craft on the fly. The uncertainty of the future sunk into my bones. But, I made it out in one piece. I learned a lot of valuable information during my time exploring Vietnam on a motorbike. I’ll tell you how to prepare for your trip the right way, especially if you’re a rookie like I was. Take my best tips, hop on the perfect bike, and enjoy Vietnam in the most exciting way possible. Hands down, this is the most important tip on the list. Motorbikes are not the safest way to get around, so prepare your body for the worst case scenario. Wear a helmet, gloves, thick jacket, face mask, goggles, and any other protection you can get your hands on. It will be worth the effort. While I usually travel solo, I decided to motorbike with a fellow Hanoi hostel-goer, Cris, and I’m glad I did. While we started the trip as strangers, our wild and unpredictable journey has turned us into friends for life. Additionally, in the case of a breakdown or an emergency, having someone around to help will be invaluable. Cris helped me deal with two flat tires, a minor crash, and gave me valuable advice throughout our life-changing trip. Rain is pretty much inevitable in Vietnam, even if you’re traveling during the “dry” season (November through April). Bring head-to-toe water protection and make sure to safeguard your cargo as well. I wrapped my backpack in a thick, black trash bag and a waterproof pack cover for good measure. There will also be mud — lots of mud — along your journey. A pair of rubbery waterproof pants and heavy-duty boots will go a long way in keeping the swath of thick, nasty muck from infiltrating your existence. After a couple of unsatisfying visits to motorbike shops in Hanoi, a friend recommended Style Motorbikes, and I’m glad I took his advice. Styles keeps their bikes in great shape, offers a 24-hour help line and free riding lessons for new riders, suggests trip routes, and charges fair prices. The relaxed staff members are helpful and professional. They have stores in Ho Chi Minh City, Hoi An, and Hanoi, so it’s possible to pick up and return your bike in different locations. Phone service in Vietnam is fast, reliable, and very affordable. I purchased a SIM card with two months of unlimited data at the airport for only $13 US. Having constant access to the internet allowed me to make reservations, contact friends and family, and tend to the website without the need for a Wi-Fi connection. Just make sure to unlock your phone first, so it is able to accept an international SIM card. Having hands-free maps will make life much easier during your motorbike adventure into the Vietnamese frontier. Buy or rent a phone mount for your trip, it will be one of your most valuable pieces of equipment. Obviously, don’t use your phone for texting or internet surfing while you’re riding, that would be downright reckless. Even if you have a local SIM card, it will serve you well to have access to Google Maps regardless of the strength of your signal. Downloading maps of your route ahead of time will allow you to navigate, access waypoints, and search for restaurants and gas, even when the service is non-existent. I recommend using Google Translate. Be sure to download the Vietnamese language add-on so you can communicate with locals even if you don’t have phone service. This app has helped me find mechanics, order delicious food (and avoid eating dog meat), and have long, meaningful conversations with my homestay hosts who spoke no English. Vietnam Coracle offers detailed traveling and motorbiking guides to Vietnam. The biking guides are complete with Google Maps loaded with recommended routes, restaurants, and gas stations along the way. 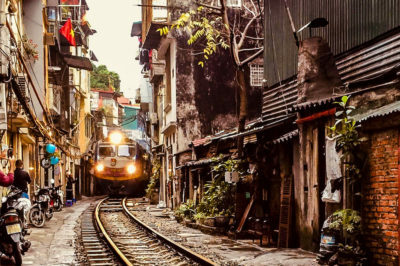 Tom, the website’s creator, is passionate about Vietnamese culture and offers endless thoughtful tips and advice to those traveling the country. Rise with the crowing roosters, drink some strong Vietnamese coffee, and get on the road with ample daylight ahead of you. The sooner you get moving, the more time you will have to stop for photos, explore small villages, and deal with unexpected delays. And, there will be plenty of delays. Getting off to a late start sets the tone for your whole day. It will force you to ride during the hottest hours and push you to rush towards your next destination. Drivers in Southeast Asia just kind of do as they please. Cars and semis daringly pass regardless of oncoming traffic, bikers run red lights when the mood strikes, and pedestrians walk into busy roads without hesitation. Traffic laws don’t seem to be applied or followed much, for better or worse. Know that the roads in Vietnam will be chaotic and prepare to conquer the madness. It is impossible to predict the course of your day on the road, so welcome the randomness of life on a motorbike and roll with the punches. I experienced flat tires, wipeouts, nasty weather, reckless drivers, unpleasant people, and awful road conditions along the way, but I always knew that something wonderful was waiting just around the corner. Torrential rain, breakdowns, late starts, and unexpected delays can throw even the best itineraries out of balance. Be willing to temper expectations and adjust plans on the fly during your journey. Give yourself the gift of a flexible and generous trip window and your days on the road will be carefree and relaxed. Don’t plan too far ahead during your journey. Sure, put together a loose itinerary, but know that it will probably be tweaked and reworked constantly along the way. Late starts, breakdowns, and pesky weather can mess up your best-laid plans, and that’s okay. Motorbikes aren’t allowed on highways in Vietnam, so don’t include them in your plans. If you’re using Google Maps to navigate, select the ‘Avoid highways’ box under ‘Route options’ and your phone will stick to routing you along roads that you are allowed to use. Motorbikes don’t have to pay tolls in Vietnam, so don’t worry about trying to save money by enabling the ‘Avoid tolls’ box on Google Maps. When you do approach a toll station, follow the path for motorbikes, which should be on the rightmost side of the road. You can breeze past the tollways without ever stopping. The weather will have a profound impact on your overall experience when you’re exploring on a motorbike. Check the forecast first thing in the morning, before you prepare for your day. Vietnam is known for its heavy rain (especially in the summer), so be ready to deal with it and be willing to take time off from riding to let especially bad weather run its course. While many of the roadways in Vietnam are well-maintained and a joy to ride on, they can change in an instant. Potholes, ruts, mud, and wet, oily surfaces can show up out of nowhere, so stay focused and adjust your driving style accordingly. Pay extra close attention on turns to avoid sliding out on gravel or slick patches of road. Water buffaloes, cows, goats, dogs, horses – I encountered them all on the roadway during my trip through the north. While some animals are more aware than others, keep an eye on any and all creatures near the road. Assume they are all oblivious to your presence. Be ready to dodge the aloof animals that wander into your path. Cars, trucks, 18-wheelers, and other motorbikes are going to drive recklessly and pass dangerously – it’s just how things work in Vietnam. And, let’s face it, no truckers will be moving their rigs out of the way for a puny little motorbike. So, be ready for the chaotic roads and react defensively and safely to the unpredictable maneuvers of other drivers. Cars and motorbikes honk at each other frequently in Vietnam, and it’s not considered rude. Use your horn to alert other drivers and pedestrians of your presence on the road. Beep regularly when you’re passing other drivers, approaching pedestrians, or passing through busy intersections. Let other drivers know you’re around – it’s the safe and logical thing to do. It’s simple: the darker the road gets, the more dangerous the motorbike journey. When day gives way to night, visibility diminishes leaving less time to react to road conditions, pedestrians, and other drivers. Roads in Vietnam are poorly lit (if they’re even lit at all) and are stressful to ride on at night. Limit your riding to the daytime and enjoy a safer journey. Riding a motorbike through Vietnam can be an emotional experience. If the frustrations from the road push your mind towards negativity, take a few deep breaths, focus your psyche, and push onward with a positive attitude. Driving angry and distracted can lead to reckless and foolish decisions and put your safety in jeopardy. If you’re riding in a bad mood, you’re doing it wrong. In my experience, the Vietnamese police don’t have much interest in pulling over foreigners on motorbikes, and this seems to be their common mindset. There are exceptions to the rule, however, as I’ve heard stories of police soliciting bribes from foreigners. Driving without a Vietnamese drivers license is technically illegal, so respect the driving laws and be ready to talk to cops if the moment arrives. Homestays are an extremely affordable way to live, however briefly, with a local family and immerse yourself in authentic Vietnamese culture. More often than not, the hosts of my homestays provided exceptional food, warm hospitality, and cozy, clean accommodation. While it’s sometimes tempting to blaze down the road as fast as your bike will allow, realize that excessive speed lessens your reaction time and will threaten the safety of you and other drivers around you. Drive effectively, not recklessly. The beauty of Vietnam is best enjoyed at reasonable speeds. To ride through the gorgeous Vietnamese countrysides, interact with the welcoming people, and enjoy the affordable and flavorful cuisine is an absolute privilege. Don’t take it for granted. Express your gratitude. Tell the locals how much joy their country has given you. They’re proud of Vietnam and your kind words will be music to their ears. Smile often, be patient and generous, and respect the country that has hosted you so graciously. Being a kind-hearted traveler will pave the way for future explorers who ride down the same path. So, there you have it: all the best tips and advice I can offer for an unforgettable journey cruising through the sensational and thrilling land of Vietnam. If you’re going to hop on a motorbike and explore this wonderful country, do it the right way. The thrill of experiencing Vietnam on two wheels is an exhilarating feeling that can’t easily be replicated. Safe travels! May the journey be fascinating, inspiring, and life-changing. Are there any tips that I missed for motorbiking in Vietnam? Do you have any questions about my experience renting a bike and driving over 1600 kilometers? Reach out by leaving a comment below! I love the “don’t ride in a bad mood” tip. SO TRUE!! Great advice all around, thanks! – fill up you gas in time? Great point! I nearly ran out of gas in the middle of nowhere and it was a really stressful experience. Appreciate the feedback. Happy travels!